The third Ramsar wetland inside the iSimangaliso WetlandPark, is a 155 kilometer stretch of coastline with sandy beaches interspersed with rocky reefs of beach rock. This marine reserve starts just South of Cape Vidal along the Indian Ocean and ends North at Kosi Bay on the border with Mozambique. 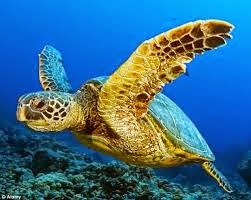 The site is the principal nesting and breeding ground for the Endangered Loggerhead turtle and the Vulnerable Leatherback turtle. 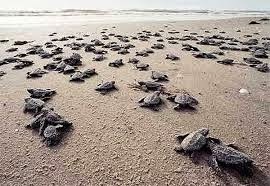 Access to the turtle beaches is very restricted for understandable reasons. Guided turtle tours are available from Thonga Beach Lodge near Mabibi Beach during the breeding season from November to February. We reached Thonga Beach on 28 February, the last day of the guided tours. Unfortunately it was already fully booked and we could not experience the tour. There are also several walking tour guides available during the turtle breeding season. Most of them operate from Bhanga Nek near Kosi Bay. For an up to date list of accredited guides, visit the iSimangaliso Wetland Park’s website at www.isimangaliso.com. 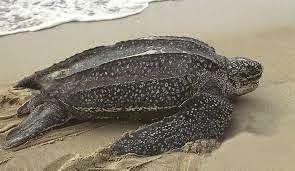 Leatherback Turtles can weigh up to 900kg. They reach sexual maturity at age 12 and breed only every 3rd year. A female can produce 700 eggs in a breeding season with an average of 70% emergence success. 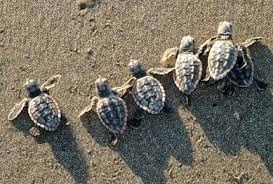 Loggerhead Turtles weigh between 80kg and 140kg. They only reach sexual maturity after 36 years and also breed only every 3rd year. A female can produce 300 eggs in a breeding season with an average of 80% emergence success. Fish species diversity is high, with 991 species having been recorded in the Marine Protected Areas. 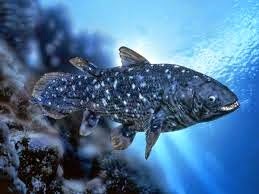 Coelacanths, the critically endangered living fossils, were discovered in Jesser Canyon near Sodwana Bay at 107 m in October 2000. 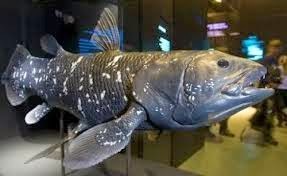 Subsequent sightings of this ancient fish in the same area were reported by the multidisciplinary Coelacanth Ecosystem Programme.